Tim is an experienced trial lawyer having tried approximately 100 cases. His practice has focused almost exclusively on civil litigation and trial work. 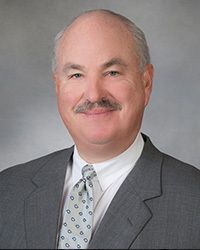 He represents area physicians, healthcare providers and medical facilities in claims involving professional negligence, contractual issues and class action disputes. As the majority of his cases are medical in nature, they are often highly technical and require advanced medical knowledge and comprehension. Tim has represented many clients in cases involving significant long term injuries and death. This extensive work in the healthcare field has resulted in many successful long-term client relationships. Tim has achieved the highest possible Martindale-Hubbell rating for legal ability and adherence to professional standards of conduct, ethics, reliability and diligence. Although litigation is Tim’s passion, he also runs a cattle ranch. While running cattle is a far cry from the courtroom, Tim finds the wide open spaces and physical labor to be a relaxing break.